We are ushering in a new phase, where users would be free to join finahub without being invited by an existing user of the site. The new user registration is free and simple. As part of this release, we are also introducing some major changes to the functionality of the site. Details of the changes we have made are given below. The welcome page has been redesigned to match the current functionality of the site. 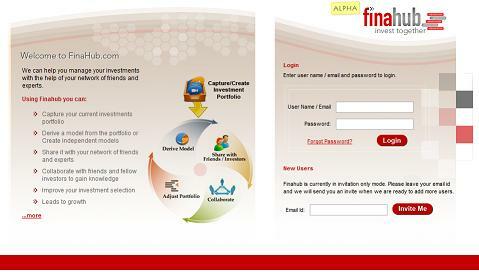 Finahub started out as a social portfolio management site but as we progressed more features were added. 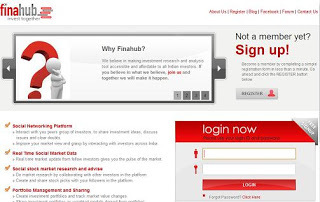 Now finahub is a full-fledged social network for the investment community. The old welcome page does not convey the full information needed for a first time user to determine the usability of the site. Due to this reason, we have redesigned the page with much more richer content. The welcome page conveys the major features of the site and also states what we stand for. We hope this would help the user in accessing the site and make the decision to join the site. Friend relation dropped in favor of following-follower relation. We feel that a friend relationship does not capture the essence of the natural relationship between people in the investment world. People follow the lead and advise of better investors but they may not be friends with each other. In order to reflect this, we are removing the friend relation and the friend tab. In its place, the user would able to follow other users on the site. The market updates of users you follow will be visible in your timeline. All your current friends are not lost instead friend has been made to be mutual followers. Please note that we have limited the scribbles to be passed between mutual followers. The follow/follower page has been introduced to show the list of people who are following a user or the list of people who the user is following. These pages are also visible from the user's public profile. 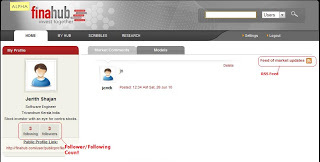 The public profile and investor home shows the follower and following count. The market update of any user can be subscribed as a RSS feed. RSS feed would allow users to make market updates of a user to be added to their blogs or to be read using RSS reader. We have also made number of UI changes to improve the usability and ascetics of the site. We think that these changes would improve the user experience of the site. All these changes were made with the intention of giving our users a better service. Please let us know what you think about these changes. We are aware that there is a lot of room for improvement and we are working wholeheartedly to address those issues. We would like to emphasis the fact that your feed back and support plays an important role in shaping Finahub. So please don't hold back, send us those emails, twitter mentions or write on our facebook fan page wall, we are looking forward to it.